Janette Stevenson has undoubtedly been one of the most successful Scottish veterans ever. In the Scottish Masters Cross Country Championships she won eight individual titles (from W35 to W55) plus two team titles with Falkirk Victoria. Her record in the British and Irish International CC is unparalleled, improving from 4th W35 at Wrexham in 1988 to 3rd W40 in 1989, 2nd W40 in 1992 and then winning four titles: 1st W50 in 2000 and 2001 and 1st W55 in 2005 and 2006. Only her younger team mate Fiona Matheson looks likely to emulate Janette. In addition she won the 1995 Scottish Senior 10k title in 35.22 at Cumbernauld, at the age of 46. Her W50 time of 36.25 for 10,000m in June 1999 ranked fourth on the all-time lists. In 2007 she set a European 5000m record (18.25) in Riccione, Italy. At the age of 58 in Dublin on 6th April 2008 she set a world W55 record of 38.23. Then in June 2009 Janette ran 3000m in 11.20 at the Scottish Masters Track Championship, creating a new W60 world record. 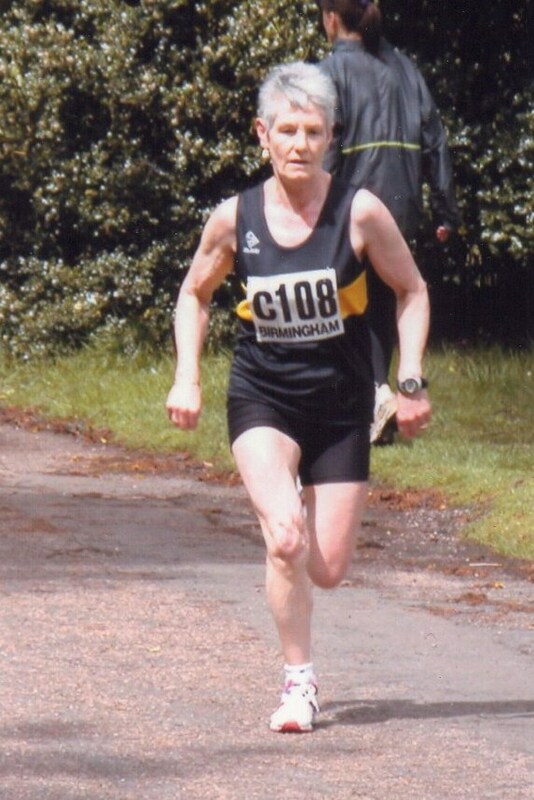 In March 2014 (aged 64) she made a fantastic come-back to win W60 gold in the BMAF cross country championships in Glasgow. Never did any running at school. In primary school in 1950’s Glasgow the only P.E. I can remember was Scottish Country Dancing and a lot of messing around with beanbags?? At High School in Grangemouth the preferred sports for young ladies were hockey (which I hated) and netball. I was in the 1st year netball team and played in centre position as I was too wee to score points. Once a year in the summer we had the school sports day. I can’t remember anyone training for it we just lined up and ran like the clappers. It was all 60 metres dashes as I remember and I was usually left standing by the bigger girls. Might have been different if we had to run maybe half a mile or cross country but there were no opportunities for that in those days. I got involved in running in 1984 there was an initiative between Woman’s Own Magazine and Nike the sportswear company to get women into running. It was rolled out countrywide in sports centres and was augmented by a weekly training programme in the magazine. It started in April 1984 and the objective was to run a 10K in September. They would let us run round the gym – nice and dry. But the coach I always remember this, said “If you don’t run in the rain in this country – you don’t run!”, and he opened the doors and shoved us out to run half a mile round the park. The training was twice weekly and one of the coaches was veteran runner Hugh McGinlay. Most of us managed to run the 10K and I think my time was 54.09. After the race Ian Cluggie a coach at Falkirk Victoria asked us if we would be interested in jogging with the club so I started training and the rest is history. Probably as I mentioned before Ian Cluggie the women’s coach with Falkirk Victoria in the 1980’s was the most influential person at the beginning of my running career. He pushed me to train on the track and persuaded me to enter events which I would not have had the confidence to enter on my own. We often disagreed over training as I wanted to run 10Ks and half marathons on the road but his background was track running. But therein lies another story. Also at that time there was a group of female runners within Falkirk Victoria who provided great competition and companionship. The only one still running I think is Caroline Lawless. We were later joined by that superb athlete Fiona Matheson and we enjoyed some success in team events in road and cross country. Also my husband Andrew who trained with me for a while and was a very patient “bag carrier” and always very supportive in the face of my pre-race nerves and bad temper. Self confidence. Discipline. A lifetime obsession. Physical fitness. Opportunity to achieve targets. Travel to races all over Great Britain and overseas (No need to puzzle over where to go on holiday – just find a race or Championship and go there! Probably winning the National 10K road championships in Cumbernauld as a Master in May, 1995 with a time of 35.22 at age 46. Also in 1999 just turned 50 in June I took gold W50 in the European 10K road championships in Bruges. In the same year, July at the BMAF track Championships at Meadowbank Edinburgh I took gold in the W50 10K then in August I took gold in the W50 5K and 10K at the World Masters Track Championships in Gateshead. Nothing too much. Just remember running in the Barnsley 6 miler after being awake all night due to loud music and traffic noise outside hotel. Not being involved in athletics in my teens and twenties. Not being able to compete at my best in the W60 category due to ill health. Reading, films, television, walking, cycling, cooking, baking, travelling UK and Europe in my motorhome. Visiting grandchildren in Dublin. And I love cuddling up with my Burmese cat Jason. Gaining international vests for cross country. The discipline you get from training. Running and racing overseas, Spain, Malta, Italy, United States, Belgium. On holiday you always know the best bars and cake shops as you suss them out on your morning training run. Companionship of like minded people. CAN YOU GIVE SOME DETAILS OF YOUR TRAININGWhen I was training seriously the max I have ever run is 50 miles per week. A long run on Sunday probably 10 miles max 13 miles. Probably in summer 2 track interval sessions plus one LT session. In winter probably hill reps, mile road reps and one shorter rep session as well as recovery mileage. Now only running about 25 miles a week, with some intervals and fartlek.